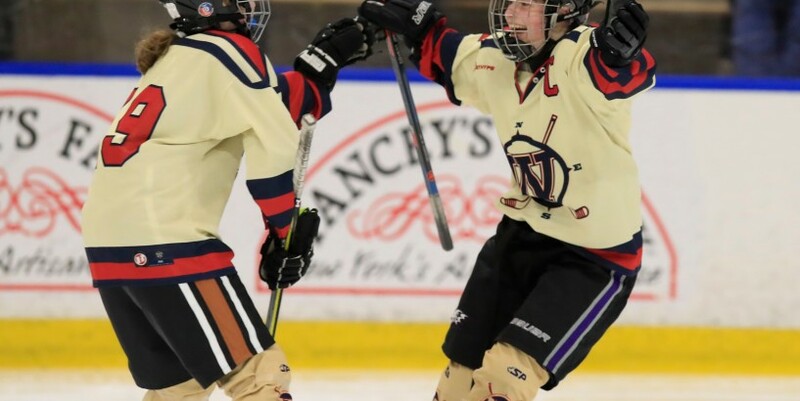 As Emma Roland helped the Williamsville girls hockey team in its pursuit of a state championship, she added some flair to her already prolific scoring touch. Roland scored three goals to help Williamsville to a 6-1 win against Potsdam of Section X in a New York State Public High School Athletic Association semifinal Friday at HarborCenter. Her third goal, however, put an exclamation point on Williamsville’s win. With less than six minutes left in the third period, Roland blocked a shot by Potsdam defenseman Alex Quinn from the right point on a Sandstoners’ power play. Roland picked up the puck inside the blue line, passed Quinn, then crossed the neutral zone and skated in uncontested against Potsdam goalie Coryn Young to score her third goal of the game on a backhand shot. Two days after Roland helped Williamsville win its first Section VI championship, she helped her team secure a spot in the NYSPHSAA state championship game for the first time in program history. Williamsville (15-3) will face Skaneateles of Section III in for the state title at 6 p.m. Saturday at HarborCenter. Skaneateles defeated Plattsburgh 3-0 in the second semifinal on Friday. “We’re all just so excited, to get to this point,” said Roland, whose team plays in its first state championship game. “We knew that our trip wasn’t over, and that our goal was to play tomorrow, and that’s what’s happening. Roland and Elisabeth Sidorski combined to score three goals in the first seven minutes of the third to break the game open for Williamsville, whose defense kept the Sandstoners (16-3) of Section X from creating many quality scoring chances in the second and third periods. Potsdam outshot Williamsville 24-21, but Kennedy Emerson scored Potsdam’s only goal with five minutes left in the third. Roland’s third goal was the perfect example of that philosophy. Williamsville coach Rick Hopkins lost track of the number of shots his team blocked against Potsdam, but his team’s defense limited chances for Potsdam’s top line of Emerson, Erica Sloan and Isabel Boyd. Cavalieri gave Williamsville a 1-0 lead on a power-play goal at 8:31, when she picked up a rebound to the right of the crease and beat Potsdam goalie Coryn Young (16 saves). Williamsville missed a chance to make it 2-0 with about 90 seconds left in the first, when Ella Huntley shot high of the goal in a one-on-one situation against Young, but Huntley took a penalty for roughing with 50.8 seconds left in the first. Timby (16 saves), Williamsville’s goalie, stopped three shots in the final 20 seconds of the first to preserve her team’s 1-0 lead, and Williamsville killed off the remaining 40 seconds of the penalty to Huntley at the start of the second. Karley Green’s shot from the circle about a minute into the second period banked off the post to Timby’s right, and about three minutes later, Potsdam missed another chance to tie the game at 1-1 when Emerson, on a 2-on-1 play, passed to Sloan, who was unable to square up for a shot against Timby. Roland’s 29th goal of the season gave Williamsville a 2-0 lead less than nine minutes into the second, and Williamsville killed off a slashing penalty against Erin Roland, called with 3:47 left in the period. Less than six minutes into the third, Elisabeth Sidorski and Roland scored a pair of goals 49 seconds apart, and Roland added her third goal with eight minutes left to help Williamsville secure a spot in the state final.